"Proletarii vsekh stran, soyedinyaytes! "note Workers of the World, Unite! Soyuz Sovetskikh Sotsialisticheskikh Respublik (СССР in Cyrillic) - the Union of Soviet Socialist Republics. Also known as the Soviet Union, the USSR, or (almost always incorrectly) Soviet Russia. The last designation will be our first subject. You will hear hundreds of Westerners in Cold War contexts (even all sorts of people who should and do know better) calling the place Russia and its inhabitants Russians. 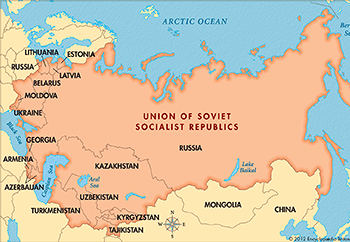 In fact, Russia was only one of the fifteen Soviet Republics that comprised the USSR, and was officially called the Russian Soviet Federative Socialist Republic (RSFSR). Yes, the RSFSR was by far the largest state in the USSR, covering over three quarters of the total land area of the Union and containing about half of its population at its dissolution. And Russia was dominant politically and culturally. But it was by no means all of the USSR. Naturally, part of the issue predates the rise of Communism as a philosophy: the Russian Empire's nationalist policy was highly slanted towards Russians and government recordings rarely ever bothered with taking other ethnicities into account, to the point that the term "Russian" (both russkie and rossiyanin, which were back then synonyms - check the Russia article for information on the modern use of these terms) meant "any subject of the Russian Empire" most of the time. Furthermore, even when "Russian" was used to describe ethnicity, it referred not only to modern Russians (called Great Russians) but also to other East Slavic peoples closely related to them, such as Ukrainians (Little Russians) and Belorussians (White Russians). Other ethnicities, particularily those that were not European, were usually lumped under the umbrella term "inorodtsy". The communist revolutionaries of the subsequent decades became the first political movement to deliberately consider "the national question", along the lines of a distinct cultural, linguistic, and even religious identity—creating a highly charged political issue in both times of peace and war. The basic framework, and the resulting nationalities (as listed below) have survived and are generally recognizable today. While Russkie certainly ran the show, many of the most famous and infamous Soviets weren't Russian. Yakov Smirnoff (he of "In Soviet Russia"- when he was most famous he just used "Russia" since it was very much around then) is from Ukraine (and he was also Jewish - in Russia, Jews were and are considered a separate ethnicity, separate from Russkie, Ukrainians and others). Khrushchev was not in fact Ukrainian, but having moved there at 14, he was perceived as one. Stalin was Georgian (although he somewhat renounced that one when ruling the upper echelons of the country, his economic policy still favored Georgia, which led to great popular support in the region - with statues of Stalin being protected even after Destalinization) and his chief of the NKVD, Lavrenty Beria, was from a Georgian ethnic minority, Mingrelians. The popular singer-songwriter Bulat Okudzhava was also Georgian (although he was born in Moscow and some of his most famous songs are about the Arbat ), politician Anastas Mikoyan and his aircraft designer brother Artem Mikoyan (of the Mikoyan-Gurevitch MiG design bureau) were Armenian and the novelist Chinghiz Aitmatov was Kyrgyz. Calling many Ukrainians (especially from the Western Ukraine) Russians tends to annoy them a lot. Calling Estonians that (if they're not Russkie) probably annoys them too, since they're not even Slavs. Same goes for the Latvians and Lithuanians (also not Slavs) who spent quite a bit of time trying to fight off the Russians. It's just like calling an Irishman English. This was true even back in Soviet times. And calling Georgians Russians is a pretty good way to make them dislike and threaten you. Especially since recent events. Officially, the Soviet Union was a multinational state, with no nation given preference over any other (notice the word "Russian" does not appear in the name of the USSR). In practice, it was inevitable that Russians would mostly run the show, given that they vastly outnumbered all the other ethnic groups. On the other hand, because the Soviet constitution had the rights of the republics to secede, even if only on paper, the authorities tended to give much more leeway in running them to avoid problems, especially in the latter periods. During the Stagnation of The '70s, with its famous shortages, the official state policy was to first fund and supply the national republics to avoid problems, and for Russia proper, especially in the "Flyover Country" provinces, to get the remains and the seconds. Which also contributed to the national tensions, even if from the other side. Other groups also never lost their separate ethnic identities. Some Soviet leaders encouraged these separate identities, while others (most notably Stalin) tried to make everyone Russian. Stalin's native Georgia was always one of the least Russified Republics - its Russian minority was negligible and the local Party branch conducted all of its business in Georgian, unlike Belarus or Kazakhstan, where the Russian language almost completely displaced the local ones. In other republics there was a lot of forced and encouraged relocation of Russians to other SSR states. Without actively forcing Russification, it served to whittle down the majorities of the major ethnic groups. The legacy lives on today in some areas, notably Latvia, where the number of Russians nearly outnumber the actual Latvians. It's considered a bit of a problem. Russians themselves distinguish well between the adjectives "русский" (Russkij/Russian), which is an attribute of the Russians as a nation, and советский (Sovetskij/Soviet), which applies to things linked to the Soviet state. The degree of difference between these two terms depends on the political views of whoever you ask. Only one party was permitted in the Soviet Union, the Communist Party of the Soviet Union (CPSU). The Soviet government was essentially the means through which the decisions of the CPSU were implemented. This situation arose largely through a process of elimination (literally). Before the October Revolution, there were many different parties. When the Bolsheviks seized power, they began suppressing all the rest. Civil war broke out, becoming an excuse to annihilate opposition in general. When the smoke cleared, the Communist Party was the only faction left standing. The Soviet political system had two separate bureaucracies - the Party and the State. Holding a position in the CPSU was not the same as holding a public office in the State, people could advance in one bureaucracy or the other, and there was some degree of rivalry between the two. Nevertheless, throughout all of Soviet history (except a few years at the beginning and the end), the CPSU held more power than the State. The legislature, the Supreme Soviet ("soviet" means "council" in Russian), only met a few days a year and let the Council of Ministersnote known as the Council of People's Commissars or SovNarKom prior to 1946 (the cabinet) handle the day-to-day affairs and routinely approved its decrees. Decisions were made by the leadership of the CPSU - the Secretariat (bureaucracy) and the Central Committee (policy forum), most particularly the Politburo, which was head of the Party Central Committee. Officially the Central Committee was elected by the Party Congress, then elected a General Secretary, although official and actual were not the same in the USSR in many cases. The General Secretary did not usually hold the Prime Minister or President position, these being held by valued other members. The General Secretary was considered by everyone the actual guy in charge and Soviet history is grouped by General Secretaries. In the west, the various people you've heard being called Soviet "leaders" or "premiers" were in fact General Secretaries of the CPSU—sometimes incorrectly labeled by the western media. Sometimes they also took the office of President or Prime Minister, but most often they gave it to a trusted political ally. In the actual country, the distinction was clearer: the 'Premier' was the Head of Government (called 'Prime Minister' just like everywhere else, the Chairman of the Cabinet of Ministers), while the Head of State was the Chairman of the Presidium (often called 'President' long before the office was officially called that). Both could be referred to as 'Chairman' since they were, in fact, chairs of their respective bodies (except, of course, in cases where a chairwoman was elected, as happened on the Republican level but not on the Union level). There were elections in the USSR, but all candidates had to be approved by the CPSU. This was how the CPSU came to be more powerful than the State: in order to become a State official, you had to be elected... but before you could run for election, you needed CPSU approval. Note that, strictly speaking, candidates did not have to be CPSU members — they just had to be approved by the CPSU. For example, on the republic level, just under a half of the representatives were non-members, on average. On the All-Union level party members had a larger majority. Also, in practice, the CPSU only approved one candidate to run for each office. However, there was always the option to vote "none of the above" (or "not the above" as it were). Thus the main challenge was not the election itself, but choosing a candidate that was sure to be elected. The Soviet government sometimes ran propaganda campaigns to encourage people to vote... largely because it looked good and democratic on paper (consider the fact that American elections are often criticized for their low voter turnout). After all, saying that 90% of the population voted for Comrade Ivanov sounds good, even if he was literally the only realistic candidate. The government also pursued high voter turnout numbers by using elections as a convenient place to distribute other services: food ration cards during wartime, pension bonuses, early access to limited availability comforts like cars or expensive clothes—a practice actually used in many countries besides the United States. The CPSU had a youth movement, Vsesoyuzny Leninskiy Kommunisticheskiy Soyuz Molodyozhi (All-Union Leninist Young Communist League), better known as Komsomol. Age limit was 14-28. They were often used as an emergency labour source (to repair damage caused by natural disasters, for example), being able to move in at short notice; they were encouraged to participate in voluntary construction and settling initiatives. It should be noted that membership in the movement was strictly voluntary, and anything but universal: officially it was regarded as a desirable and decent thing to strive for, but anyone not keen on being politically or socially active (e. g. running local initiatives, doing volunteer work, holding Party activities for the youth etc.) simply didn't bother. On the other hand, an active Komsomolets/Komsomolka (M/F Komsomol member) had an administrative career track cut out for him/her if so desired. In fact, during the last phase of USSR history, it was the naturally enterprising and/or greedy young people who rose through the Komsomol ranks that usually became first successful businessmen  when business, in the form of for-profit cooperatives, became officially encouraged. Younger children could join the Young Pioneer movement, found in other Communist countries as well. Nearly all the children of the Soviet era ended up in this one, being rather akin (at least in style) to the Scouting Movement, which was banned in the USSR. Post-war, the Pioneer activities were seamlessly integrated into high school life, but weren't very demanding; only the rare and persistent juvenile delinquents managed to get kicked out or barred from joining. They could be recognized by their red scarves, worn at official functions or during holidays. Quite a number fought against the Nazis in the Great Patriotic War (the Soviet part of World War II). There were some other republics, but they were fairly short-lived, such as the Transcaucasian SFSR (one of the four founding republics, broken-up into the Georgian, Armenian and Azerbaijan SSRs in 1936), the Karelo-Finnish SSR (created in 1940 from conquered Finnish land, incorporated into Russia in 1956) and a number of republics that were proclaimed during the Civil War but did not survive until the establishment of the Soviet Union. There was even a government plan on creating a Jewish SSR, but then Israel was established in the Middle-East and the Soviet Jews moved there instead (provided that they were granted permission by the KGB, which didn't happen often). The Russian Federation, Ukraine, Belarus and the Transcaucasian Federation were the first four republics when the USSR was proclaimed in 1922. All the others were either carved out of them or established on annexed territories. Constitutionally every SSR had the right to secede, but in practice secession was not a real option before the Perestroika. At first the creation of new republics followed three rules: the republic had to have an international border or a seashore (hence Tatarstan did not qualify, even though the USSR had more Tatars than Armenians), a population of at least one million with a clear indigenous ethnic majority (hence Yakutia did not qualify, despite being one of the largest subnational entities in the world) and a strong enough economy to survive as an independent nation. However, the creation of the Karelo-Finnish SSR broke rules two and three, the possible reason being that Stalin may have been planning to annex Finland after the Winter War. Also, Kazakhstan did not lose its SSR status after Kazakhs became a minority in their own republic, the most likely reason being its huge territorial size, and that Status Quo Is God. What did not happen to Kazakhstan, but had long-standing repercussions, were the numerous autonomous republics, regions and areas ('oblasts'). Defined by geographic size and population, Tatarstan, Chechnya and Abkhazia are the famous autonomous SSR's, and Ossetia is probably the most famous oblast in the west. Depending on their size, they had smaller but symbolically very important representation than the SSR's in the Supreme Soviet. When the USSR ended, the status of autonomous republics and regions almost immediately became a serious point of contention—they didn't become independent countries like the republics, but part of their nearest neighbors. Seeing them as interference from Moscow, the non-Russian republics frequently struck away the autonomy the regions and republics had become accustomed to or considered merging them with other countries (considered in the case of Transnistria), leading the residents to resist—usually successfully, strangely enough. In cases like Nagorno-Karabakh (now an unrecognized de facto republic within Azerbaijan) the dust still hasn't settled. Ukraine and Belarus had membership in the United Nations, but this was just a diplomatic concession to ensure "balance" in the General Assembly, as the US had many, many more allies than the USSR in 1945; Ukraine and Belarus both toed the Moscow line perfectly. Stalin had originally wanted to have all sixteen (at the time) Union Republics admitted to the UN, on the grounds that they were sovereign states, until Harry Truman pointed out that by that logic, all forty eightnote Alaska and Hawaii were still US territories at the time United States (and, by implication, all six Australian states, all nine Canadian provincesnote At the time; in 1945, Newfoundland was still a separate British Dominion, all twenty-five Brazilian states, etc., etc., etc....) would have to be members, as well. Estonia, Latvia and Lithuania were independent between 1918 and 1940, before being annexed by the USSR. The United States never recognized (and much of the rest of the western world merely de facto rather than de jure) the annexation of the Baltic states, and considers their current governments to be continuations of the inter-war republics. However, some Russian nationalist historians claim their original secession in 1918 wasn't legitimate to begin with, and neither were their inter-war governments. 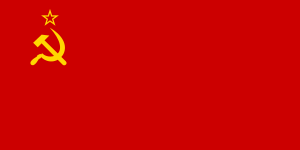 The red color of the flag symbolizes revolution for industrial workers across the globe, while the hammer and sickle represent the alliance of workers and peasants in the revolution. The star represents the Communist Party of the Soviet Union.